Regular dental hygiene cleanings are an essential step in your oral care routine. Good oral hygiene is very important in preventing many dental conditions such as teeth cavities, gum disease, bad breath and many other dental problems. 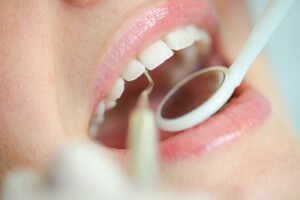 Professional dental hygiene cleanings help maintain and improve your oral and overall health. This special tool makes use of vibrations to knock the larger pieces of tartar off the surface of the tooth. These vibrations will sound like a humming high-pitched whistling sound, which may feel even louder in your mouth. It also produces a cool mist of water sprayed on to the teeth as it cleans. This helps wash away the removed debris while ensuring the area remains at a proper temperature. The length of time it takes for our hygienist to clean using this equipment depends on the extent of the deposits; this means that your first visit might take longer than all future regular dental hygiene appointments. Once the larger pieces of tartar are removed our dental hygienist will switch to finer hand tools called scalers and curettes. These are used to remove smaller deposits on the teeth and root (under the gum) surfaces. Polishing is done once all the teeth surfaces are smooth. Our Richmond Hill dental hygienist polishes your teeth using a slow speed hand piece and a Prophylaxis paste to remove stains from your teeth. There are few different types of fluoride used in our dental office. Fluoride treatments help prevent tooth decay and make your enamel stronger. Trust us with all your dental hygiene needs and book a convenient appointment today!